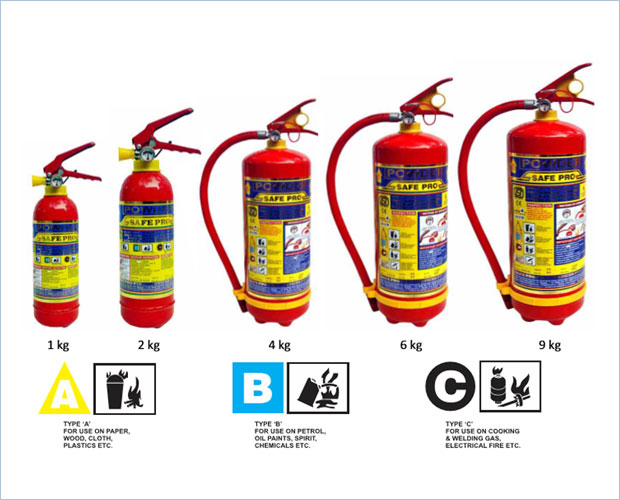 We are ABC type fire extinguisher manufacturers in Bangalore. ABC fire Extinguishers are very versatile. They are often the best selection being that they're able to put out many alternative kinds of fires. They use monoammonium phosphate that may be a dry chemical that's able to quickly put out the fireplace. it's a straw powder that's able to place out all 3 classes of fire; class A for trash, wood and paper, class B for liquids and gases, and class C for energized electrical sources. The dry chemical smothers the fireplace. Our fire extinguisher is widely used in industries, organization, plants & refineries, chemical hazard setup, Residential property, house and cars. Quality of the fire extinguishers goes through various testing, checks and inspection procedures to be the kind of fire extinguishers which will be of use, in case of a fire. Every extinguisher along with ISI & CE Certification.